Facing an uncertain budget environment in the coming months, the U.S. Air Force will nevertheless continue developing a new long-range strike bomber (LRS-B) capable of delivering both conventional and nuclear weapons. 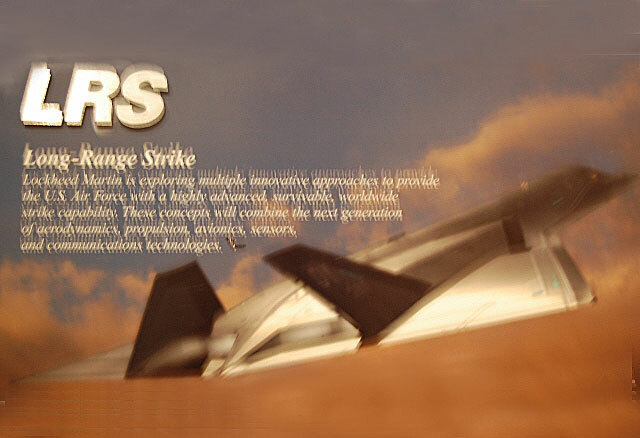 “Long term, we’re committed to the long-range strike bomber. We’re going to try to keep programs like that on track,” Air Force Secretary Michael Donley said. Donley briefly discussed the secret LRS-B program during a “state of the service” briefing at the Pentagon on January 11. He was accompanied by Gen. Mark Welsh III, recently appointed Air Force chief of staff upon the retirement of Gen. Norton Schwartz last fall. Donley said he would issue guidance to the major Air Force commands to prepare for threatened “sequestration” budget cuts that would reduce the service’s operations and maintenance spending by 20 percent unless Congress acts to stop sequestration by March 1. Secretary of Defense Leon Panetta has advised Air Force leaders to plan “reversible and recoverable” cuts for the balance of Fiscal Year 2013, which ends September 30. The LRS-B was initiated in Fiscal Year 2012 as a successor program to the cancelled next-generation bomber effort. Major contractors interested in the program were instructed not to discuss their proposals in public. The LRS-B will be a “family of systems,” an optionally manned platform incorporating already proven subsystems, including engines, radars and avionics, according to the Air Force. In its Fiscal Year 2013 budget submission, the service said the LRS-B average procurement unit cost is expected to be $550 million for 80 to 100 aircraft. Planned funding for the program from Fiscal Years 2013 through 2017 is $6.3 billion, with $300 million programmed in the current year. The Fiscal Year 2013 defense authorization bill Congress passed last month directs the Air Force to ensure that the LRS-B is capable of carrying strategic nuclear weapons from the date on which it achieves initial operating capability. The USAF budget would look better if it was not wasting billions ferrying around preseidential families for long vacations. They cut frontline spending not the wasteful VIP fleet budget. LRS-B will not look terribly impressive on paper or in the skies if it is truly using OTS engines and avionics. What it -may- do is allow for early block retirement of 2-of-3 of the 'triad within a triad' bomber fleet whose CPFH O&M is through the roof for limited actual difference in capabilities. Standoff Weapons have always and will continue to dominate the bomber attrition vs. penetration capabilities matrix (how many you cross commit to hit a given range of targets and thus how much real risk to the inventory you endure with or without local escorts) and 'in the most likely scenario' of Near Peer threat, all three existing jets are nominally JASSM capable. Surprisingly, the B-1 continues to be saved from the chopping block as first to deploy this capability, even though it is the worst of the three in terms of reliability issues but . But the important nod must be to the fact that a commitment to 2,500 ER variant AGM-158B with their 500+nm standoff capability and subsonic launch restrictions essentially takes all three of the existing bombers out of relative performance merits conditions. Neither the B-52's absolute payload, the B-1B's speed of internal payload delivery northe B-2's LO really matter here. Only operations costs as ease of maintenance. In this, it should also be remembered that the LRASM variant is likely going to be going on multiple ships as a lighter weight, smaller, replacement for TLAM and these will carry them as 'wooden rounds' for pennies on the mile. Unless you honestly contemplate hostaging industrial facilities deep in the heartland of the PRC or Russia with conventional weapons, there is no real need to consider mission factored performance other than this. Which means that, as with ODS, where Secret Squirrels were launched in as few as pairs off of B-52G/H, the airborne delivery numbers may not require a fullup eight shot rotary launcher volume commit but be simply parent loaded to tandem stations in much shallower bomb bays (this will also save both cruise drag as fuselage sectional thickness and turn around times as multiple weapons stations can by jammered rather than taking a queue to service the CSRL). A 737 size wing platform with stations internally and externally for a realistic 4+4 JASSM loadout is also going to be MUCH cheaper to design and to keep operational. Similarly interesting is the potential inherent to the shift to smaller baseline weapons than the GBU-31/32 hammer class for the rather less likely direct attack mode. The GBU-53/B, hopefully with rocket boost to take it out to 80-100nm, will mean quads of BRU-61s can also be uploaded at roughly 2/3rds the weight to these same clip stations and allow for a much higher target servicing list even as they take down the gross payload totals from the roughly 60,000lbs of the Cold War dinosaurs to perhaps as little as 25,000lbs in a followon (total demanded DMPI count as station availability, vs. the shift to a dedicated launcher like the CBM being the determinant factor for this more than actual weight of the 1,650lb loaded BRU-61). Additional weapons and particularly those which are outsized may again be parent loaded via external hardpoints (MOAB, MOP, GBU-37) while EWP pods with dedicated bus interfaces could greatly ease integration of AMRAAM and other 1760B weapons to provide at least a /measure/ of self defense. I also fully expect to see something between an ADM-160 and a GAM-72 as long endurance, expendable, organic target approach force for targeting in built up areas where SpecFor are not immediately available. Such sacrificial UAVs will have considerable (4-6 hour) endurance and secure comms/aperture capability making the possibility of post mission recovery to a carrier deck or VTOL platform a real consideration. Alternately, for lower end cyber threats, there is the possibility of CBA type 'sonobuoy' stack launching of Silent Eye or Griffin or similar close approach BIA and light attack hardware. What remains to be seen will be how far black world follow-ons to the like of ATL progress before an inclusion/rejection decoupling decision is made on their viability within the LRS-B. While DIRCM is almost a given, without some kind of aggressive hardkill capability, any new bomber will not be able to be risked as a functional penetrator after the mid-21st century point and may well prove more valuable if allowed to serve as technology driver for packaging a reliable DDP FO (Digital Diode Pumped Fiber Optic) laser than for any other purpose. An SDB-II is likely to cost a minimum of 50,000 dollars and be vulnerable itself to increasingly sophisticated terminal defenses from softkill jammers to APS and even groundmount systems like C-RAM. Being able to switch between or at least penaid -enable- such a slow subsonic weapon's terminal defense penetration via an onboard 2,000 dollar lasing system could be a way to keep kinetics viable in the near term. IMO, such a system will have to be dedicated however in terms of LO control over apertures placement and coverage arcs vs. mission prioritization (self protect vs. offensive A2G) and so will _not_ be pallatizeable as a 'pod in the bay' type system. I am not as disturbed by the manned/unmanned configurability options. Of course you will never get optimum volumetric configuration control efficiencies this way, the cabin being too far forward to serve as a fuel tank for mission extension for instance (at the same time it is likely to be too small to serve as a reliable relief crew rotational system, see the B-2) but given these assets will, even if new, likely cost tens of thousands of dollars per flight hour to run and be entirely too valuable to risk losing in an extensive cyber as DEW and hunting weapon environment of unreduced IADS, the notion that they will be used as loitering weapons cabinets in another AfG or Iraq conditioned guerilla war very low. No penetration and too great an operational CPFH for casual use means that these bombers won't need to be making choices about loiter vs. LO. Instead, you will see them as heavily supported SOW carriers to help break-in a forced entry attack under those conditions where Naval CMs will not reach far enough for whatever reason. Depending on region and capability in an A2DA condition, they may also form an element in early reduction of naval forces where Carriers are not available or cannot be committed due to risk. In both of these, I expect base-in will still occur within 4-6,000 miles of the engaged theater and this too will limit (via AAR) the total platform size as costing. Probably the most unrealistic element of LRS-B for me is the near certain belief that these jets will never reach their cost goals, even with severe OTS restrictions that essentially turn the jets into commercially supportable, zero-lifed, bus platforms. With that as a given, the expectation for 80-100 jets is too high and should be economically scaled back to somewhere between 30 and 50 on the expectation that they will augment and ultimately replace the B-2 while the Bone and BUFF are immediately retired to support development of LRS-B. This would in turn allow full funding options for flexible inclusion of high risk developmental systems like the laser. If the USAF sells another death spiral platform as an inexpensive systems bucket without markup due to gold plated enablers 'not on the shopping list' but absolutely essential to making LRS-B functional to a Congress trying desperately to justify massive cutbacks in set asides and social welfare to stay ahead of debt servicing on a broken currency, they may well be in for a severe "Then you're done." anti-deficiency termination surprise. Best to be honest about what you need and size the buy (as the doctrine) accordingly.